Simon & Schuster/Paula Wiseman Books, 9781481448451, 40pp. 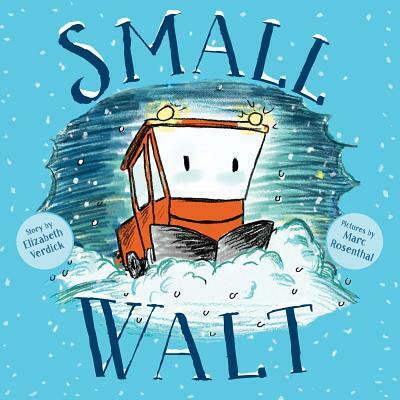 A tiny snowplow determined to prove his worth battles a blizzard in this supremely charming story in the tradition of Mike Mulligan and His Steam Shovel and The Little Engine that Could. I plow and I salt. but I’ll show them all. Small Walt and his driver, Gus, take on a blizzard! All the bigger snowplows doubt that Walt has what it takes to plow the roads in the storm, but Walt is determined to prove them wrong. Brimming with onomatopoeia and Walt’s affirming chants, this sweet picture book shows that when it comes to strength, size doesn’t matter. Bestselling illustrator Marc Rosenthal’s wintry scenes make this book the perfect cozy read-aloud. The smallest in a fleet of snowplows always gets picked last in a snowstorm, but he and his driver, Gus, show that teamwork and perseverance pay off. Artwork reminiscent of Virginia Burton's classics begins with a double-page spread of eight snowplows—eyes and eyebrows on their windshields—facing out in front of a tall fence. . . . Charming and endearing: "ChuggaMmmm-hmmm!" After a blizzard hits, it looks as though Walt, “the smallest snowplow in the fleet,” will be left behind in the parking lot, unable to keep up with bigger plows. Then along comes Gus, a worker who knows that Walt is up for the job. Verdick (Peep Leap) assumes a chummy tone in her concise narration and keeps the storytelling taut. There’s just enough vehicular geekiness for aficionados: Gus goes through a four-point checklist to make sure that Walt is in good working order, and there are sound effects throughout. But what gives the story its verve is Rosenthal’s digitally colored pencil artwork, which has a matter-of-fact open-heartedness and a compelling sense of place that recalls the stories of Virginia Lee Burton. Yes, Walt wins the respect of the big machines, but what feels more important is the relationship between snowplow and driver. When the story concludes with Gus tying his blue scarf around Walt’s rearview mirror, declaring “A blue ribbon for my buddy,” readers will know their bond is the real thing. The grit of the Little Engine that Could, the nostalgic illustrations of Katy and the Big Snow, and a touch of modernity from an accomplished author and illustrator, combine to become Small Walt. . . . The timeless messages that little people can do big things, one should never give up, and teamwork works best are pervasive throughout. . . . A warm and fuzzy dose of positive thinking perfect for seasonal storytimes and snow days. Yes, picture books featuring personified trucks abound, but libraries should make room for this one, too. It’s really the story of a little guy who gets a tough job done, and little children will root for him all the way. Older-than-dirt adult readers will be reminded of Katy the snowplow from Virginia Lee Burton’s Katy and the Big Snow, and indeed Rosenthal’s art channels Burton in its coziness. . . . This will make a fine bedtime story for a snowy night, reassuring listeners that heroes of all stripes are out there keeping the community safe. A heroic snowplow braves a blizzard in SMALL WALT, a picture book about persistence that brings to mind the Little Engine That Could. In Elizabeth Verdick’s lively telling and Marc Rosenthal’s subtly retro pictures, Walt is a mall red snowplow in a row of powerful yellow monsters. As snow falls from the night sky, Walt is the last to get a driver, but he cheers up when the man check hims over and runs him through his paces. Soon Walt is churning through the snow: “My name is Walt. / I plow and I salt. / They say I’m small, / but I’ll show them all.” It’s a perfect book for revving up small helpers to pitch in with the shoveling.